"This tool set includes advanced selection tools where you can select elements based on different criteria (e.g. 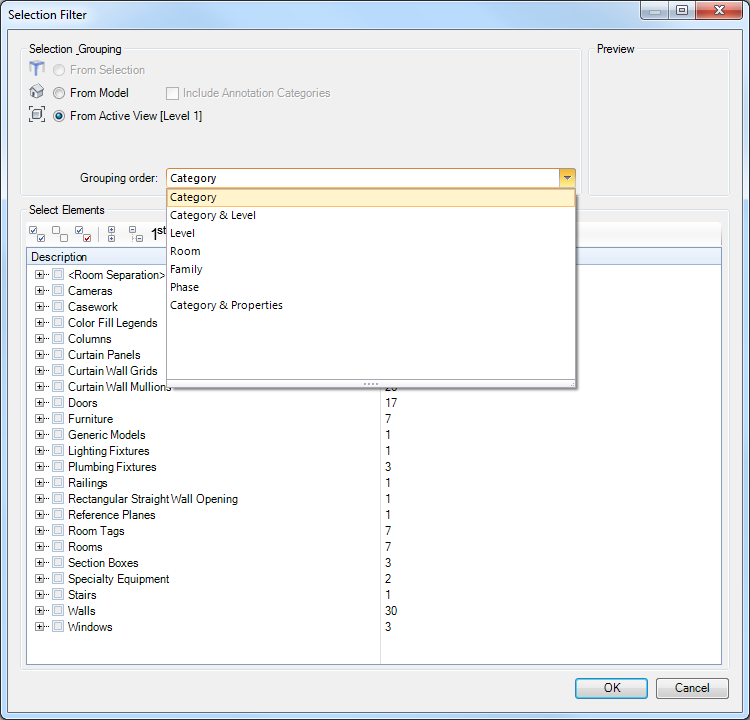 Levels, Categories, Phases ...)"
"The Selection Filter tool displays a tree of elements in a project, grouped according to the users selection (e.g. by Category). It enables efficient control over the selection of certain elements. This tool enables the users to filter elements either from the selection, whole model or active view. When selecting Instances based on Properties the properties are now grouped by Instance and Type"
"Users can select one or more Instances in the model and the tool will automatically select all Instances with same Category or Type. The tool displays a popup dialog box allowing you to select instances in the whole Project or just in the active View."